The centerpiece of a dining table always plays an important role in decoration. Depending of the season, this special spot can help set the mood of the area. 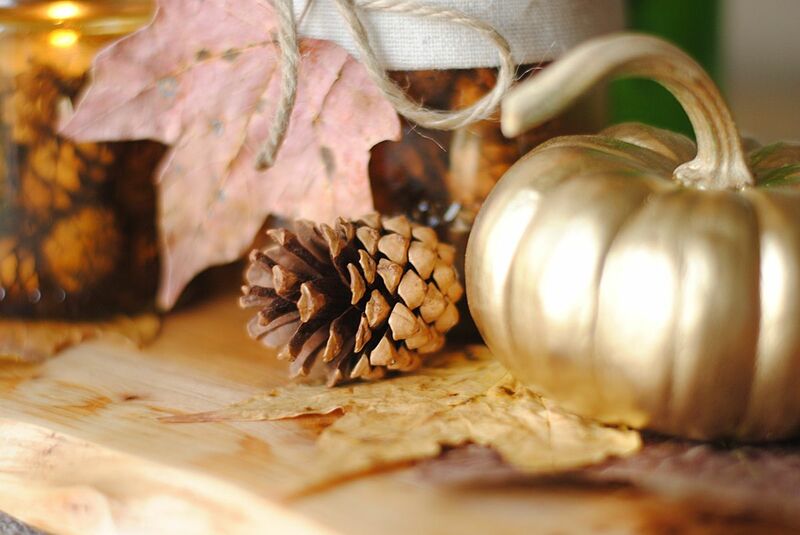 If it’s Spring, you can use vivid tones; but for Thanksgiving most definitively you’ll find yourself using a neutral palette where maybe browns and golds are your main colors. 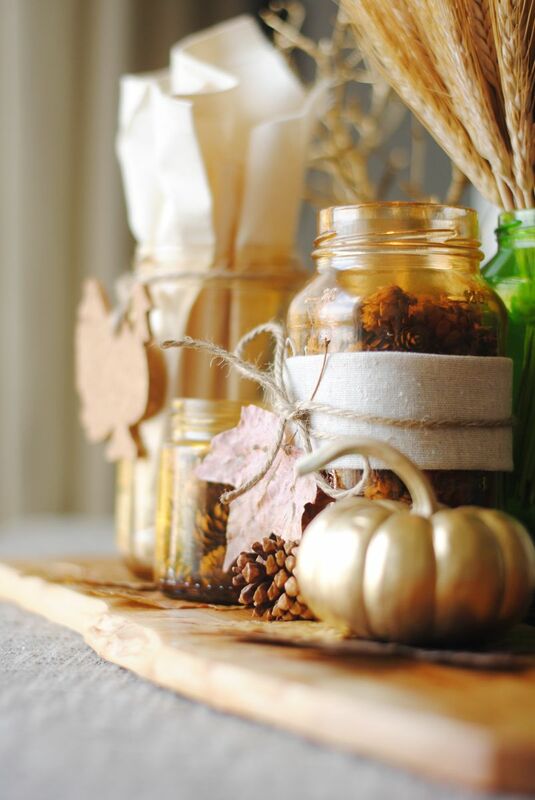 This year Jo-Ann send out a fun theme to some bloggers (I was one of them) to be used as the main inspiration for the Thanksgiving tablescape. Today I’m sharing my ideas for the theme #TurkeyTableScapes that involves some items you might already have around your home. My first project will be painting with some food coloring and Mod Podge (both available at Jo-Ann) some used sauce jars I’ve been putting away. 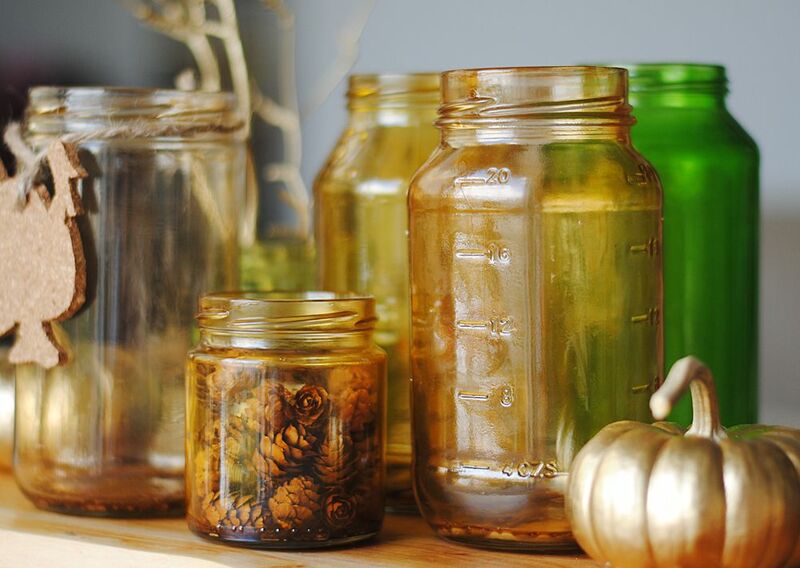 The method is very simple; combine on each jar 1 tbs of Mod Podge and 1/2 tbs of water plus 7-10 drops of food coloring. If you still have the lids, cover and mix by shaking the jars. Wait until everything inside seems to be covered with the mix and there are no weird streaks of the coloring. Then empty the solution and dispose of it. Let the jars rest upside down over newspaper for around 10 mins (note: I waited around an hour and almost all the color came off, so I had to do it all again). On a baking tray place some wax paper and the jars open side up (make sure the rims are clean). Then put this tray on a preheated oven at 250°F for 45 mins. Take them out carefully and wait until they are cool. Because I was aiming for a neutral palette I used brown and green food colorings on my jars. Another easy project that will complement my #TurkeyTableScapes is a turkey made out of cork. At Jo-Ann I bought a pack of 4 inch cork squares and drew on one of them the silhouette of a turkey. You can download it here but remember to re-size it to fix your cork. With an X-acto, I carefully cut the form of the bird and then did a small aperture so I can pass some twine. Later I hang it on one of my jars for an added touch. For my last craft I took one of the small jars and filled it 3/4 parts with mini pine-cones (I bought a nice box of them at Jo-Ann). 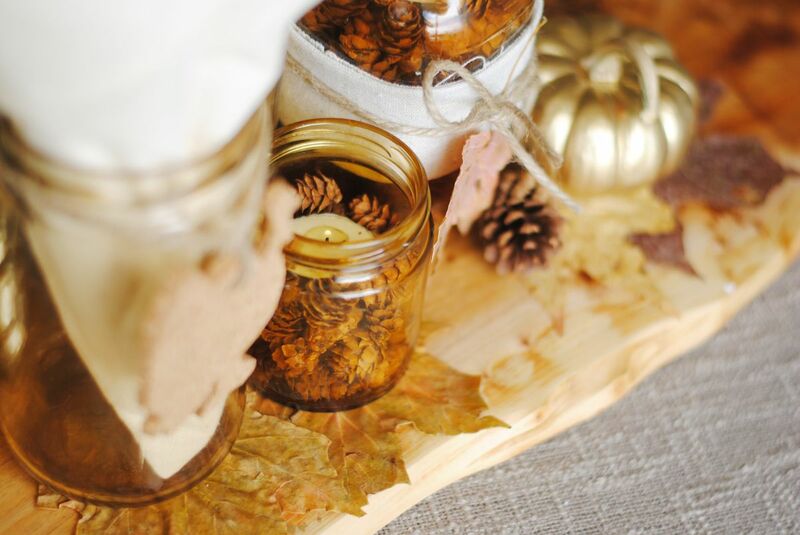 I then inserted an unscented votive candle an carefully added more pine-cones to the sides to cover the metal part. 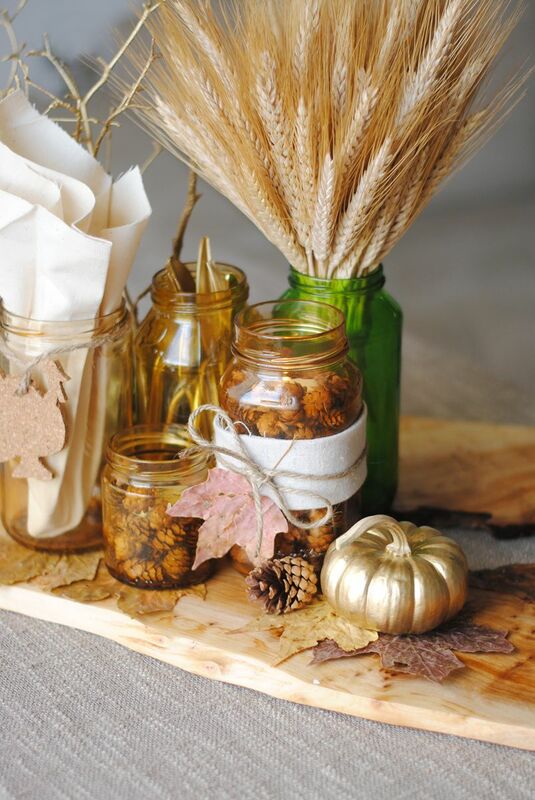 To finish my tablescape I just played with the arrangement of the jars, and decorated them with dry maple leaves and spray painted mini pumpkins. 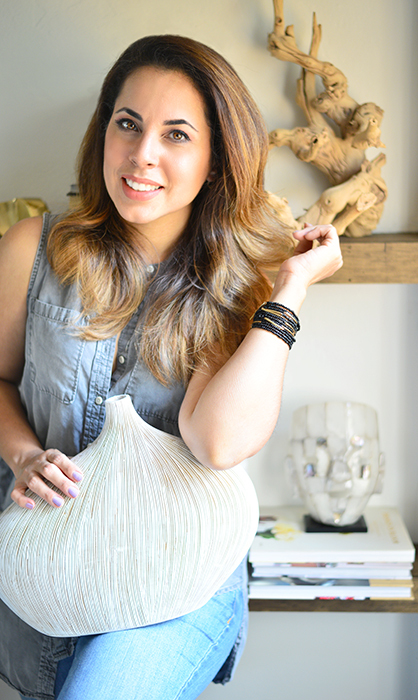 I really enjoyed making this centerpiece and playing with the natural colors and textures of each of the items I selected. 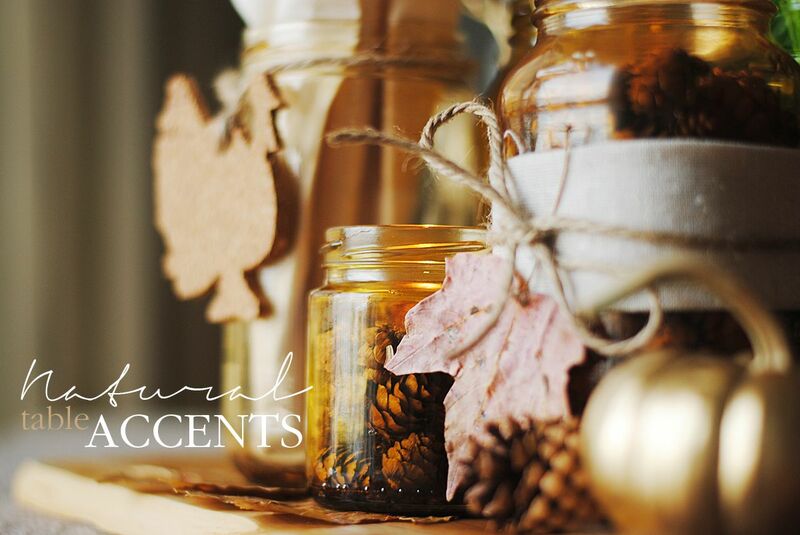 You can give these jars so many uses. 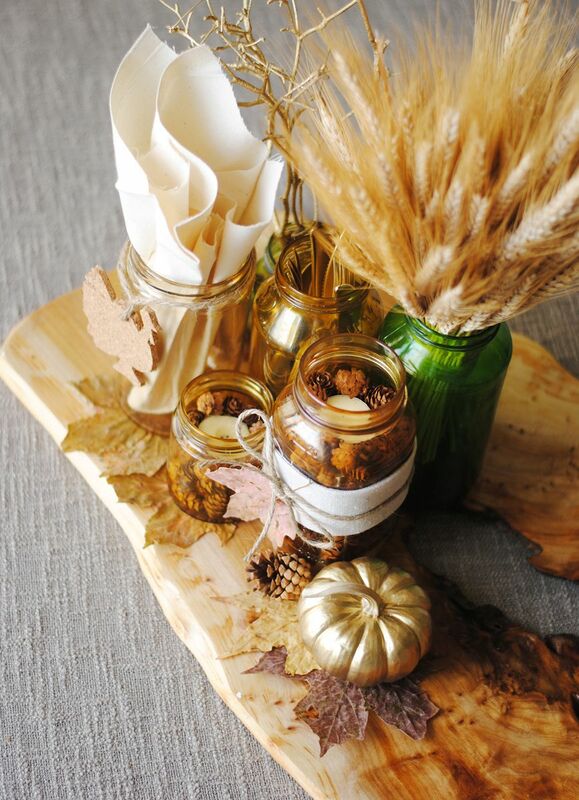 Maybe place the utensils on one of the tallest jars or even your beautiful napkins. The possibilities are endless. I hope you all have a wonderful Thanksgiving with your loved ones. But before you go to have your “gabble-gobble” feast, remember to visit Jo-Ann’s craft catalog which is so full of great ideas for the Holidays. Also, don’t forget to print your coupon from Jo-Ann valid until November 30, 2013 for all those last minute project materials.